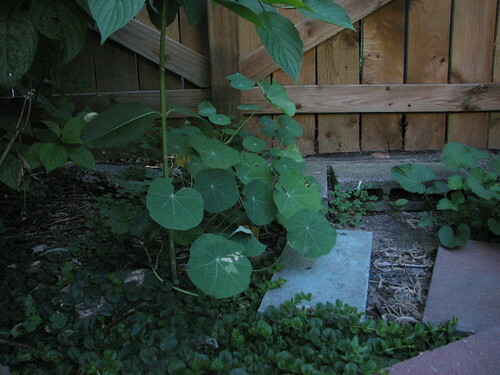 The nasturtium 'Spitfire' I planted in full sun is growing like a weed, with vines heading off to foreign lands (the patio, the sidewalk, the veggie garden). I can't train them on the railing yet because we're waiting for the guy to come back and finish painting it. Of course, on the day I took pictures, there was only one flower to be found. ...but it hasn't flowered yet. Mine are not enjoying the hot weather either. Unfortunately, I saw on the weather this morning that it's only going to get worse. Lovely. Your blooms look redder than mine. I've had some really, really orange ones, and now a couple of reddish-orange ones, but still more orange than anything else. 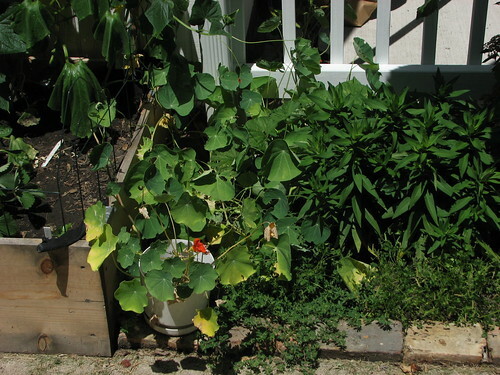 I'm not on this project, but I do have some nasturtiums growing in containers for the hummingbirds to enjoy. Mine have variegated or wine-tinged foliage, so they look cool whether in bloom or not. I hope yours rally despite the heat--it's being an odd summer for a lot of people. 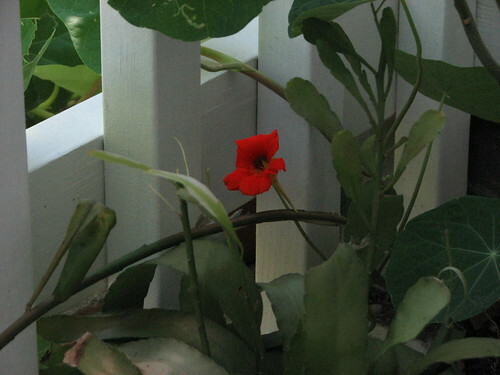 That is so odd; the nasty in my sunniest location has the most flowers, but is bushy wide rather than climbing tall. And your first one looks a ton darker/more rd than mine... but since I love orange so much, I'm not complaining, lol! I love the bright red flowers! Glad to see they're doing well! I really like that color. I saw a pink one on someowne's blog and thought it must be a very unusual newer variety. Your nasties are looking great Diane. I'm experiencing the same thing - nice foliage but no bloom in shadier spots, nice bloom and nasty foliage in sunnier spots. They definitely don't seem fond of the heat we've been having. That's funny about the nastie growing up an area where you can't allow it to grow wild because there needs to be work done on it. Sorta the same thing happened with me and the fence I planted mine under. I figured they'd be stalled while I got it painting but they decided to grow ahead of last year's schedule.